Does this mean you’ll be blogging more? Wow, no more blackboards in classrooms anymore? I remember the colored chalk was the best kind, now I suppose it is the colored markers that get the attention. Wow, you have very nice handwriting. I hope you enjoy the break!! It sounds like the kids really adore you. 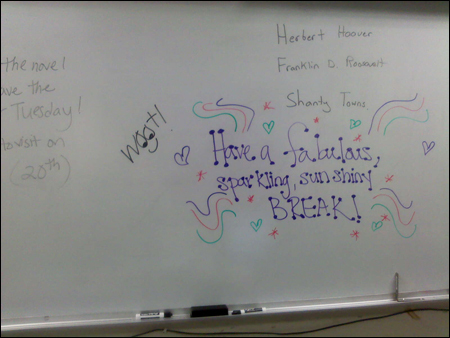 I hope you had a great break! I really like all the colors you used on the board. I don’t put that much effort into things I write on the board. Elementary kids are so disrespectful that I’m sure someone would go up and erase half of it for no reason. Have a ncie break You have really neat handwriting. I hope you’re enjoying the free time:) I also have to say that your handwriting is pretty amazing! You do have nice handwriting! Hope you are enjoying Christine time!